Grand Rapids City Hall is located at 300 Monroe Avenue N.W., Grand Rapids MI 49503; phone: 616-456-3010. 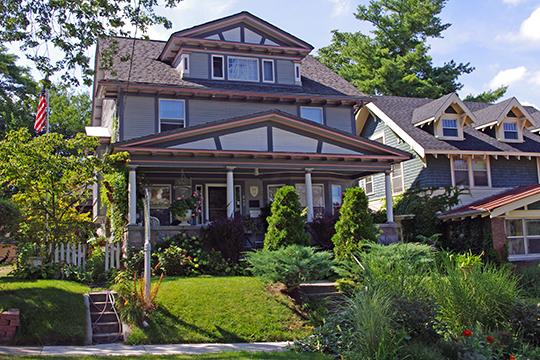 Photo: President Gerald R. Ford Boyhood Home, 649 Union Avenue SE, Grand Rapids, MI. Ford lived here from 1921 to 1930 at age 8 to 17. Listed on the National Register of Historic Places in 1995. Photographed by User:SSTEFFEK (own work), 2012, [cc-by-3.0 (creativecommons.org/licenses/by/3.0)], via Wikimedia Commons, accessed February, 2013. We have no knowledge of the first white man who visited the rapids on Grand River, called by the Indians the Owashtenoug. An Indian village had long existed here — of the Ottawa tribe — before any white men came here to reside. The history of this village, of its chiefs and warriors, of its forays and defenses, its councils and treaties, is lost in oblivion from human knowledge. In 1821 Isaac McCoy — who was appointed by the Board of Managers of the Baptist Missionary convention for the United States, to labor in Illinois and Indiana — visited General Lewis Cass at Detroit, to lay before him the claims of that society, and the needs of Indian tribes of the Michigan Territory. The General received him cordially and gave him $50, in goods, for the benefit of his mission at Fort Wayne. At the Chicago treaty of the same year, through the influence of Colonel Trimble, of Ohio, the Pottawattomies agreed to give one mile square of land, to be located by the President, in consideration of the promise of the government to locate thereon a teacher and a blacksmith, for the instruction and aid of the Indians; the government agreeing to appropriate $1,000 each year for that object. A similar arrangement was afterwards made with the Ottawas, the government agreeing to maintain a teacher, a blacksmith and a farmer, at an expense of $1,500 per year. Detroit at that time contained only a few hundred inhabitants, and the whole territory of Michigan was a vast wilderness, with only here and there an oasis of a fort or trading post. On the west side if the Grand River, and on what is now the City of Grand Rapids stood, at that time, a collection of 50 or 60 huts, Kewkishkam being the village chief, acknowledging the control of Noonday, chief of the Ottawas. On the 28th of June, 1822, Mr. McCoy went from Fort Wayne to Detroit, for the purpose of securing the privileges of the Chicago treaty, the war department having placed the matter under the control of General Cass. General Cass commissioned Charles C. Trowbridge to make definite arrangements with the Indians for the sites of the missionary stations. The site for the Pottawattomie station was established on the Saint Joseph River, and that of the Ottawas on the Rapids of Grand River. Mr. McCoy visited Grand Rapids in 1823, accompanied by a Frenchman named Paget, and one of his Indian pupils, for the purpose of putting matters into operation at the contemplated station among the Ottawas; but he was unable to make any satisfactory arrangement, and soon returned to Carey, as the Pottawattomie station was called. In the fall of that year he had a blacksmith shop set up at Kalamazoo, but only a little was done with it, so far as we can learn, and it was afterwards removed to Grand Rapids. Some time in 1824, Reverend L. Slater, Baptist missionary, and a blacksmith and one or two other white workmen, came to Grand Rapids and commenced work. Mr. Slater erected a log house for himself and a log school house — the first buildings ever put up in the county. History and Directory of Kent County, Michigan, Dillenback & Leavitt, publishers, Grand Rapids, 1870.